Back in January of 2017, Jake McIntire wrote a short piece to introduce us to Ogden City's desires for a Creative District, centered around 25th St. east of Washington Blvd., and extending up to Jefferson Ave., the newly renovated Main Library, and hopefully, a "reVived" Lester Park. A little over a year (and some half-dozen public input meetings and Open Houses) later, the city is putting finishing touches on the area's boundaries, reviewing proposed designs, debating clever names, even acquiring property to make it all work. Smack in the center of the whole shebang is 455 25th St., a massive historic building (National Register of Historic Places, 2012) that many around town have been just begging to see redeveloped. They're about to get their collective wish. That building, with a storied history including stints as diverse as the Ben Lomond Hotel Garage and the fondly-remembered El Toro Bravo restaurant, is under construction, and set to become the artistic and creative "hub" around which much of the district's future development is likely to follow. 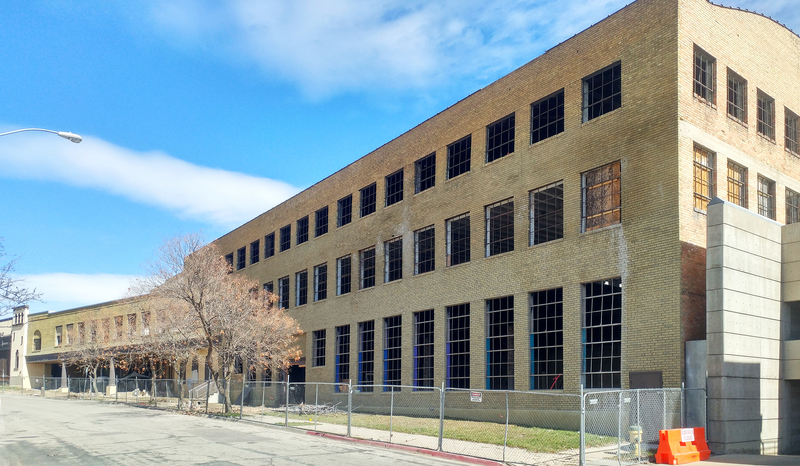 "The Monarch", as the building will be known beginning this April, has bold intentions to be “the future of the creative community in Ogden; combining event, exhibit, collaborative, and entertainment experiences..." with art studios, exhibition space, restaurants and even a makerspace (think of a gym for artists). Just imagine - 60,000 square feet of creative energy, spilling out into the surrounding neighborhood! Enhanced streetscapes, improved lighting, daily attractions and events, all inviting pedestrian traffic. Sounds like a great addition - and connector - to the downtown, doesn't it? How about the addition of new gallery space? A new restaurant, to fill in the blanks between the Bigelow Hotel's new grille and recent newcomer Cuppa? Importantly, this massive project is being led by a private developer. Fischer Regan Enterprises is both mindful of the site’s past and optimistic about Ogden’s future. Other developments and improvements to long-neglected buildings and sites are sure to follow. Inspired and encouraged by the success of O1ARTS' PLATFORMS outdoor gallery, the city and FRE envision a new vibrancy in the soon-to-be-named district, with "major installations, pop-up performances and annual events"... leading "artists and other creatives (to) find a wealth of resources and enjoy sharing their talents with the community at-large and visitors to the area. Art ...woven throughout the public realm, creating an experience of discovery for residents and visitors alike." The vision is ambitious, and to be applauded. It will take time to develop and longer to mature.... but it IS underway. Construction on The Monarch, for example, started in February, and it won't likely welcome its first tenants until Spring 2019. But they're already receiving inquiries about creative studio spaces - something in high demand and short supply in town - and are hosting a groundbreaking ceremony on April 6. There's still a lot of design, permitting and budgeting to accomplish as regards the new streetscapes, too. But, inspired by O1ARTS’ Polkadot Project, the city is already planning a community-participation event for late June, to help set both tone and tenor for the area, and to make the connection to Lower 25th and its summertime gems like Farmers' Market and an expanded Ogden Twilight concert series. 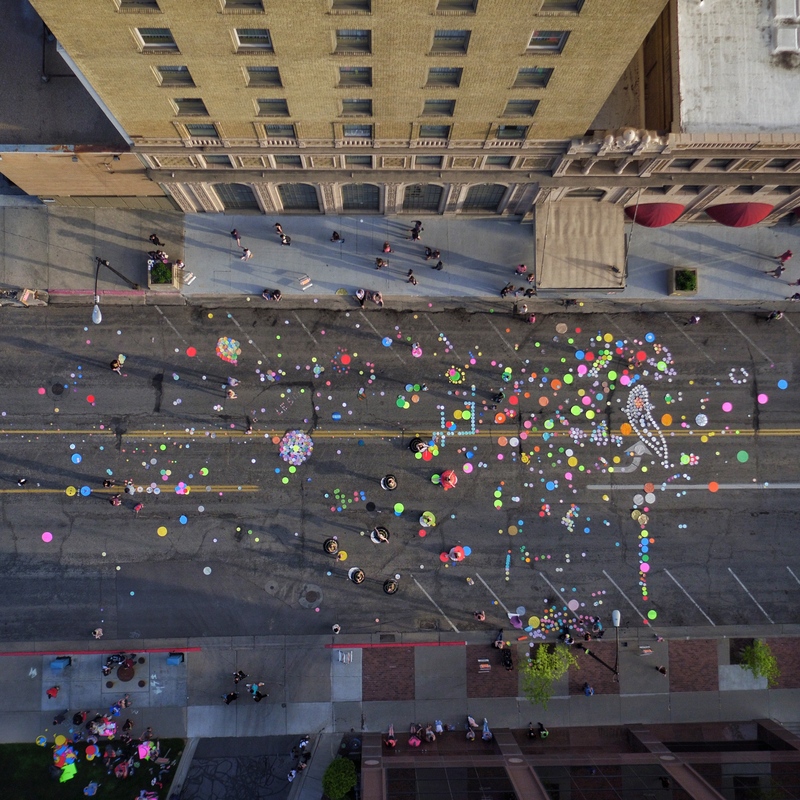 Overhead view of Ogden First's Polka-Dot Project on 25th St. during the MOMENTS festival, May 5, 2017. Photo courtesy of Tyler Hollon. This is another great opportunity to actually participate in, and leave your mark on, a project intended to benefit the whole community….Make sure you're subscribed to Ogden City Arts' Facebook page https://www.facebook.com/ogdencityarts) to get the latest on that and other arts-related events. A year from now, upper 25th Street will have a whole new feel… what a difference a year can make.